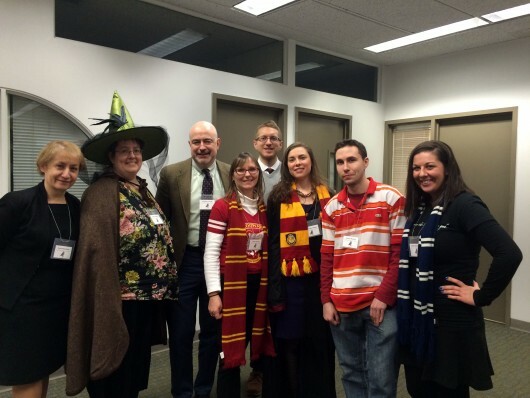 On a cold January night, CUMC’s Augustus C. Long Health Sciences Library (HSL) was filled with students, faculty, and guests decked out in festive attire representing the four houses from Hogwarts School of Witchcraft and Wizardry: Gryffindor, Slytherin, Ravenclaw, and Hufflepuff. Currently on display at the HSL is “Harry Potter’s World: Renaissance Science, Magic, and Medicine,” which encourages guests to explore the history of science and medicine through the adventures of the famous fictitious boy wizard. The exhibition, curated by Elizabeth J. Bland, is the second to visit CUMC from the National Library of Medicine and National Institutes of Health. Touring the United States since 2009, the exhibition links British author J. K. Rowling’s Harry Potter book series to 15th- and 16th-century science and medicine. At the Jan. 28 opening, Joel A. Klein, PhD, lecturer and postdoctoral researcher in Columbia University’s Department of History and research fellow at the Chemical Heritage Foundation, gave an interactive presentation about the history of alchemy and its connection to medicine. Dr. Klein also kept attendees on their toes by incorporating pertinent Harry Potter trivia questions related to alchemy. “Harry Potter’s World: Renaissance Science, Magic, and Medicine” will be on display on the first floor of the Hammer Health Sciences Building until Feb. 28, 2015. It is free and open to members of CUMC and the surrounding community. For more information about the exhibition, as well as upcoming programming and events at the HSL, visit library.cumc.columbia.edu.